Swaddling baby correctly is crucial for safety reasons and it is not difficult to do. Doula Pam Diamond shares her traditional Baby Burrito method with us as well as her preferred helpful products on the market. Is it safe? SIDS risk? Even though families have plenty of excellent options, parents may enjoy knowing how to create a good “burrito” swaddle. This method uses a large swaddle blanket - usually a square of fabric. Please use blankets designed for the job, such as good quality muslin swaddle blankets - not any old thing within arms reach! 1. Begin with the blanket in a diamond shape and fold the top corner down to form a triangle. 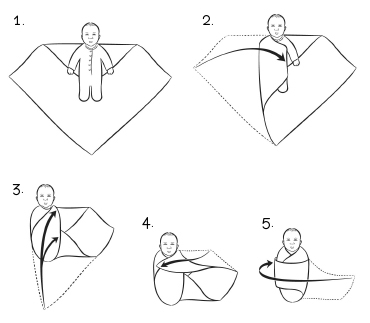 Place baby in the center of the folded area with their head just above the fold of the blanket. Baby’s shoulders are below the fold. 2. Place baby’s right arm slightly bent at the elbow flat against their body. Take point of the swaddle on the same side as the right arm and bring it across baby’s chest. 3. Ensure the arm is securely under the fabric. Tuck the edge of the blanket under the body by tilting baby to the left and secure it snugly. Fold the bottom point up & over your baby’s feet and tuck under left shoulder and along baby’s left side. 4. Then, hold baby’s left arm slightly bent at the elbow against his or her body, take the right point & bring it across baby’s chest and under and around back. 5. Tuck excess fabric into the swaddle to secure it. The snugness should come across baby’s torso and not hips. Your baby’s legs and hips should be loose enough to flex. Should your baby appear to break out of this conventional wrap, Pam advises her secret Houdini-proof method - you can contact her through her website listed at the bottom - or to try Miracle Blanket as discussed right below. A swaddled baby should be put down on his or her back only. Babies should only be swaddled during sleep times. Baby needs her hands free to learn about the world during her wakeful times. There are several options on the market from which to choose. This is typically simply a generously sized, lightweight square of fabric. You can find them easily in your local store or online. Just don't pick up any old blanket you happen to have lying around. Make sure to get a dedicated one, specifically meant for swaddling. Maybe the easiest option are to get one of these simple muslin swaddle blankets. The muslin fabric is light which is important to avoid over-heating. And it just works well to make a nice fold. 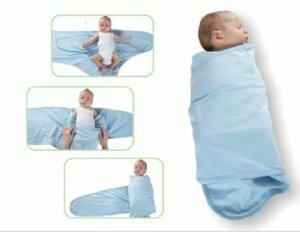 The Miracle Blanket is a clever swaddle blanket with wings built into the fabric to keep baby's arms in place. It even has a pouch for the legs. This design makes it really easy to make a good and safe swaddle. It's also great for little Houdini's as you can easily make a nicely tight fit. I love them. Two other decent options are Velcro swaddles and Zip Up ones. They are easy to use and convenient as quick-fixes but have some disadvantages for some. Velcro swaddles have pouches for the legs and wraps for the arms that are fastened by velcro. The downside of these is the noise the velcro makes when changing a diaper in the middle of the night, possibly causing unwanted waking. Zip up swaddles (like the Woombie), also easy and self-explanatory. A downside is that these may not restrict movement enough for some babies. *Pictures courtesy by Pam Diamond.